We can learn from military courage and efficiency. In Hawaii, as I toured the Pearl Harbor memorial, I spotted several design features that caught my attention. On the USS Bowfin submarine, I drew a sink that folds down in front of the faucet. This design dates back to 1942, and the efficiency is very clear. Space is a precious commodity on a submarine or ship, so this design is about efficiency of the area used. Notice that even the soap dish holder is designed to fit into the recessed cavity. 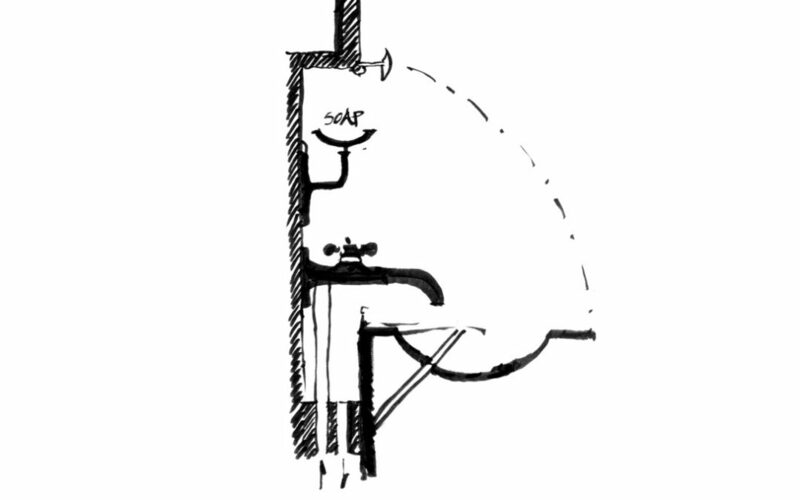 As the sink basin folds up, the curvature leaves room for the protruding faucet. Space conservation and efficiency at every turn are very important for the US Navy. Author and illustrator: Charlie Szoradi is an architect, inventor, and the CEO of Independence LED Lighting. He writes about many other topics related to plumbing, such as this wall mount sink, through his extensive travels around the world. If you have found this posting online, it is an excerpt from Mr. Szoradi’s book Learn from Looking that served as the inspiring seed content for this drawing share resource. For additional drawings and insights on water systems and wall mount sink design, we hope that you enjoy exploring LearnfromLooking.com. You can search via general terms such as sustainability as well as narrower terms such as Hawaii, wall mount sink, and US Navy.